Iran’s feared Revolutionary Guards have set up a network of secret prisons after the leadership issued a set of orders to prepare for a security crisis in the aftermath of Friday’s presidential election. The security preparations have been put in place as it emerged that the most moderate candidate in the field of seven candidates to replace Mahmoud Ahmadinejad was attracting a wave of support. Western diplomatic sources told The Daily Telegraph that the intelligence division of the Revolutionary Guards had established a new network of secret detention facilities in residential areas. The Revolutionary Guards, which report directly to the country’s Supreme Leader, Ayatollah Ali Khamenei, is using the prisons to hold anti-government activists to prevent them from participating in tomorrow’s presidential election contest. Now, to some extent this is just showing partisan differences, with both Republicans and Democrats sticking up for their guy. 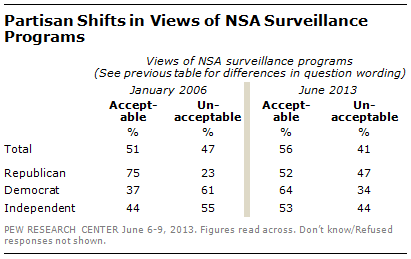 What I think is interesting is that the two NSA programs in question are very different. In the 2006 program, the government was spying on specific foreign terrorists. In the 2013 program, the government is spying on all Americans (no one believes that the program is really limited to Verizon, do they?). Moreover, the current program actually excludes foreigners. But the apparent Democratic position — foreign terrorists deserve privacy but not American citizens — makes no sense on the merits. It has to be blind partisanship. POSTSCRIPT: What about the independents, who are hovering right around a lukewarm 50% but are somewhat more comfortable now than then? I think they are responding to a partisan media. Not that the media is so keen on NSA surveillance now, but their opposition is muted. If you recall the media in 2006, you would have thought that spying on foreign terrorists was the end of the republic. My judicial nominees have waited three times longer to receive confirmation votes than those of my Republican predecessor. Let me repeat that: My nominees have taken three times longer to receive confirmation votes than those of my Republican predecessor. Obama’s claim seemed heartfelt, but it wasn’t anywhere near true. As it happens, the Congressional Research Service has just done a study comparing judicial nominations in the first terms of several recent presidents. Among other things, the study noted how long each president’s nominees waited from the day they were nominated to the day they were confirmed. . . The CRS study found that Bush’s first-term nominees waited an average of 277 days for confirmation, while Obama’s waited 240 days. So not only did Obama’s nominees not wait three times longer than Bush’s, they actually made it to the bench faster. As for the U.S. district courts, which have far more seats than the circuit courts, the study found that Obama’s nominees have waited an average of 222 days, while Bush’s waited 156. So Obama’s picks have waited longer before confirmation — but nowhere near three times as long. But what about the final results? As it turns out, Obama has had a higher percentage of his circuit court nominees confirmed during his first term than Bush did. The CRS report notes that 71.4 percent of Obama’s circuit court nominees were confirmed in his first term, compared with 67.3 percent in Bush’s first term. Obama’s complaint is also amazingly hypocritical, given his own record of stalling judicial nominees when he was in the Senate. President Barack Obama’s push back to criticism of the National Security Agency surveillance programs is that he has increased checks and balances, bringing the foreign surveillance courts into the process, for instance, and – he insists – looping in Congress. “When it comes to telephone calls, every member of Congress has been briefed on this program,” the president said Friday. Here’s the problem with that: It is not true – every member of Congress has not been briefed on the phone data program. I’m sure this guy must tell the truth sometimes, but I can’t remember the last time. Two Internal Revenue Service agents working in the agency’s Cincinnati office say higher-ups in Washington directed the targeting of conservative political groups when they applied for tax-exempt status, a contention that directly contradicts claims made by the agency since the scandal erupted last month. The Cincinnati agents didn’t provide proof that senior IRS officials in Washington ordered the targeting. But one of the agents said her work processing the applications was closely supervised by a Washington lawyer in the IRS division that handles applications for tax-exempt status, according to a transcript of her interview with congressional investigators. We’re talking about whether or not the American taxpayers will subsidize your work. We’re talking about a tax break. If you didn’t come in and ask for this tax break, we would have never had a question to ask of you. So what about the 501(c)(4) tax-exempt organization Organizing for Action? Until a few months ago the organization went by a different name: Barack Obama 2012. Indeed, their web site is still located at barackobama.com. There is no more political organization in America. Vermont’s insurance commissioner denied a license to a new statewide Obamacare health care cooperative because it is “fatally flawed” and likely to be insolvent within three years, The Washington Examiner has learned. Commissioner Susan L. Donegan of the Vermont Department of Financial Regulation also criticized Vermont Health CO-OP’s business practices, especially an “illegal” contract that would generate as much as $500,000 in income for a company owned by its president. Donegan further criticized what she described as the co-op’s “deceptive” consumer advertising. . .
She predicted the health co-op would lose money each year, attract too few customers and face insolvency in only three years. The navigators are specifically barred from giving complete advice. Specifically, they will not volunteer the fact that purchasing insurance may be more expensive than the Obamacare penalty. The navigators will be given access to a wealth of personal information, but will undergo no background check, even to exclude known felons and identity thieves. The federal government is paying for the navigators, despite being barred by law from doing so. CBS News has uncovered documents that show the State Department may have covered up allegations of illegal and inappropriate behavior within their ranks. . . In such cases, DSS agents told the Inspector General’s investigators that senior State Department officials told them to back off, a charge that Fedenisn says is “very” upsetting. Sexual assaults and drug trafficking, and “senior State Department officials” quashed the investigations. Beyond the appalling misconduct itself, just think about the ramifications: The people defending our embassies are being sexually assaulted and given drugs. Is it just possible that this might reduce their effectiveness a little bit? But “senior State Department officials” are fine with that. Is it no wonder the attack against our Benghazi consulate succeeded? Senator Mark Kirk (R-IL) questioned Attorney General Eric Holder last Thursday at a Senate Appropriations Committee hearing about whether the NSA spied on members of Congress. “Mr. Attorney General, I want to take you to the Verizon scandal and — which I understand takes us to possibly monitoring up to 120 million calls. You know, when government bureaucrats are sloppy, they’re usually really sloppy. Want to just ask, could you assure to us that no phone inside the Capitol were monitored of members of Congress that would give a future executive branch, if they started pulling this kind of thing off, would give them unique leverage over the legislature?” he asked. If Holder won’t say it didn’t happen (which he usually has no qualms about saying, even when it’s not true), then we may assume it did. Indeed, let’s take the president at his word that the existence of this shadowy IRS entity working deep within the even shadowier U.S. Treasury planted in deep cover within the shadowiest conspiracy of them all, this murky hitherto unknown organization called “the executive branch,” that all this was news to him. What that means then is not that this or that elected politician is corrupt but that the government of the United States is corrupt. Perhaps this is just the way it is in the panopticon state. Tocqueville foresaw this, as he did most things. Although absolute monarchy “clothed kings with a power almost without limits” in practice “the details of social life and of individual existence ordinarily escaped his control.” What would happen, Tocqueville wondered, if administrative capability were to evolve to bring “the details of social life and of individual existence” within the King’s oversight? Eric Holder and Lois Lerner now have that power. . . The danger here isn’t Barack Obama. This is not the first corrupt administration and it won’t be the last. The danger here is the government. It must be scaled back. We should not attack Obama primarily for being personally responsible for the scandals. For most of them he probably isn’t. We should attack Obama primarily for refusing to do anything about them, and for thwarting Congress’s efforts. (No, he hasn’t thwarted Congress’s efforts to clean house yet — other than by stonewalling investigations — but is there any doubt that he will?) And, since nothing can be done while Obama is still in office, we must remember. Unfortunately, remembering is something that the American people seem to be very bad at. This [Bush] Administration also puts forward a false choice between the liberties we cherish and the security we demand. “You can’t have 100 percent security and also then have 100 percent privacy and zero inconvenience. We’re going to have to make some choices as a society,” Obama said. He’s right now, and was demagoguing then. That doesn’t mean he’s making the right choices, just that he’s belatedly recognized the need to make them. Earlier this month, when news broke of the targeting scandal broke, Public Campaign president and CEO Nick Nyhart belittled the concerns of disenfranchised conservatives. “There are legitimate questions to be asked about political groups that are hiding behind a 501(c)4 status,” Nyhart said in a statement provide to ABC. “It’s unfortunate a few bad apples at the IRS will make it harder for those questions to be asked without claims of bias.” . . . Weeks before the National Security Agency (NSA) began a massive phone sweeping operation on U.S. cellular provider Verizon, Director of National Intelligence James Clapper told Congress the agency does not conduct intelligence on American citizens. . .
“Does the NSA collect any type of data at all on millions or hundreds of millions of Americans?” committee member Sen. Ron Wyden (D-Ore.) asked Clapper during the March 12 hearing. As we know now, that wasn’t even remotely true. I’m sure the administration will put forward some argument why this wasn’t wasn’t a lie, but I can’t imagine what it will be. It will also be interesting to find out whether Clapper was under oath. I’m starting to think that the Obama administration’s plan to deal with the scandals is to have so many of them we can’t keep them straight any more. In the latest scandal, the NSA collected call data on all telephone calls placed on Verizon’s network in the United States. (The dragnet explicitly excludes calls that originate and terminate in foreign countries.) Before I got a chance to note it here, it was revealed that the NSA is collecting credit-card transactions as well. This was so bad that even Obama’s boot-lickers at the New York Times lost patience with him, writing that he had “lost all credibility”, although they softened their criticism a few hours later. Obama proclaimed, “No more national security letters to spy on citizens who are not suspected of a crime.” He then cast his massive dragnet to spy on citizens who are not suspected of a crime using the FISA court rather than national security letters. Oh, that’s much better. I feel it necessary to contrast what Obama is doing (I suppose I should say, what Obama’s administration is doing, since he will surely turn out have been out of the loop once again) with what happened during the Bush administration. The Bush-era terrorist surveillance program was tapping the phones of specific foreign terrorists. That, of course, is exactly what they should have been doing. The part that somehow became controversial is they kept listening when those foreign terrorists placed calls to the United States. Of course. It’s utter foolishness to suggest that we should stop listening to terrorists when the call the United States; indeed, those are the calls we most need to hear. But a dishonest media reported the matter as though the administration was tapping domestic phones rather than foreign ones. The Bush-era program was spying on foreign terrorists, not Americans. The Obama-era program is the exact opposite: It spies on every American who uses Verizon or a credit card, and it specifically excludes foreigners! We don’t know the specifics of the “malicious comments”, but they don’t matter. If the comments weren’t inciting violence (which is not reported, and presumably would have been had it been so), they should have been protected speech, and once would have been, no matter how offensive they might be. Doug Shulman, the IRS commissioner when most of the known IRS misconduct took place, made at least 157 visits to the White House. If that seems like a lot, it really is. It’s nearly twice the number of known visits as the second-most-frequent high-level visitor (86). Shulman’s boss, Treasury Secretary Tim Geithner, made only 48 known visits. Nevertheless, he says he can’t remember the substance of any of those meetings. Please explain in detail the activities at the prayer meetings. Also, please provide the percentage of time your organization spends on prayer groups as compared with the other activities of the organization. Democrats are now trying to argue that it’s actually a good thing that Obamacare will double health insurance premiums. The argument, if I understand it, is that inexpensive policies only exist because they either exclude poor insurance risks or charge them more (well, yes), and thus they are unfair and shouldn’t exist. The idea that using actuarial tables to set insurance premiums is somehow wrong certainly lies at the heart of socialized medicine, but it’s a very long way from the promise that “if you like your insurance, you can keep it”. I’m reminded of years ago when professional wrestling admitted it was fake, in (if I recall correctly) a legal filing that argued it was entertainment, not sport, which thereby improved its legal position somehow. In MSNBC’s case, the article goes on to say — hilariously — that political opinion is the brand that MSNBC “has cultivated with success”. (Sure, if by success you mean having no one watch you.) But Fox, CNN, and even Headline News all manage to have both opinion and news. By managing only the opinion side, they fall into the same category as Current TV, Al Gore’s network (now owned by Al Jazeera) that manages to draw even fewer viewers than MSNBC. House investigators have found 88 IRS employees with documents relevant to the IRS scandal. A U.S. EPA-mandated device meant to reduce diesel emissions may have shut down an ambulance carrying a suspect who had been shot by police in Washington, D.C. While medics yesterday were transporting the injured man, who was suspected of shooting at officers, to the hospital, the emergency vehicle shut down. Another ambulance took the man to the hospital, where he was pronounced dead. D.C. fire officials said the shutdown likely occurred because of a device designed to burn diesel toxins. When the device isn’t working, warning lights go off in the vehicle and it eventually loses power. . . Per EPA regulations, the device is required on all newer models of diesel vehicles. Critics of the mandate have previously called for an exemption for emergency vehicles. Remember the Plame-Novak-Armitage affair, in which our media pretended they were outraged (outraged!) that someone might leak the name of a (nominally covert) intelligence employee to the press? Metric tons of ink were spent, there was a special prosecutor, there was even a movie. What made that so hard to take was the rampant hypocrisy of the leftist media pretending they thought that exposing intelligence workers was a bad thing, when in fact they love to expose covert operations. It was the Obama administration that sealed the fate of the Pakistani doctor jailed for helping nail Usama Bin Laden, by divulging key details after the fact and dooming any chance Shakil Afridi’s cover story could win his freedom, according to a confidential Pakistani report. When former Secretary of Defense and ex-CIA Director Leon Panetta publicly acknowledged Afridi’s role in the ruse which helped the CIA pinpoint Bin Laden’s presence in an Abbottabad compound, any chance that Pakistani authorities could help him get out of the country vanished, according to what some have called Pakistan’s version of the 9/11 Commission, a 357-page report from an independent body set up to probe the aftermath of the 2011 raid by Navy SEALs in which the Al Qaeda leader was killed. Panetta also discussed classified information designated as “top secret” and “secret” during his presentation at the awards ceremony, according to a draft Pentagon inspector general’s report published Wednesday by the Project on Government Oversight. . . The Washington Free Beacon advances the story of the IRS’s targeting of pro-Israel groups. It seems that the targeting was not limited to stalling tax-exempt applications, it extended to audits as well. The complaint specifically alleged an explicit IRS policy, and it named names. At the time I wasn’t sure whether the allegation was true, but now we have proof that the IRS does this sort of thing. The House committee it going to want to subpoena that guy. Yet private organizations in the United States continue to raise tax-exempt contributions for the very activities that the government opposes. People are engaging in activities the government (by which he means the Obama administration) opposes? Horrors! What is this, a free country? The White House may end up being technically blameless in this scandal, but it is clear that a very large segment of the left was all in favor of turning the IRS into a political weapon. Following the established Obama administration policy of promoting the key figures in its scandals (e.g., IRS, Gunwalker), Susan Rice — a central figure in the administrations lies about Benghazi — is being moved up to national security adviser. Replacing her at the UN will be Samantha Power, who can be expected to weaken the Obama administration’s already-lukewarm support for Israel. In 2002 she bizarrely advocated a US invasion of Israel, in order to impose a settlement between Israel and the Palestinians. Claire Berlinski’s account of what is going on in Istanbul is a must-read. Tyrannies go through phases and I’ve wondered when Turkey’s Islamists would move from the popular phase to the repressive phase. It looks like that is happening now. I worry that it’s too late. Erdogan has had years to consolidate his power; a peaceful revolt is unlikely to dislodge him now. You are currently browsing the Internet Scofflaw blog archives for June, 2013.